Yeah, I know. Another long period with no writing. And I’m sorry. Again. But let’s move on, shall we? 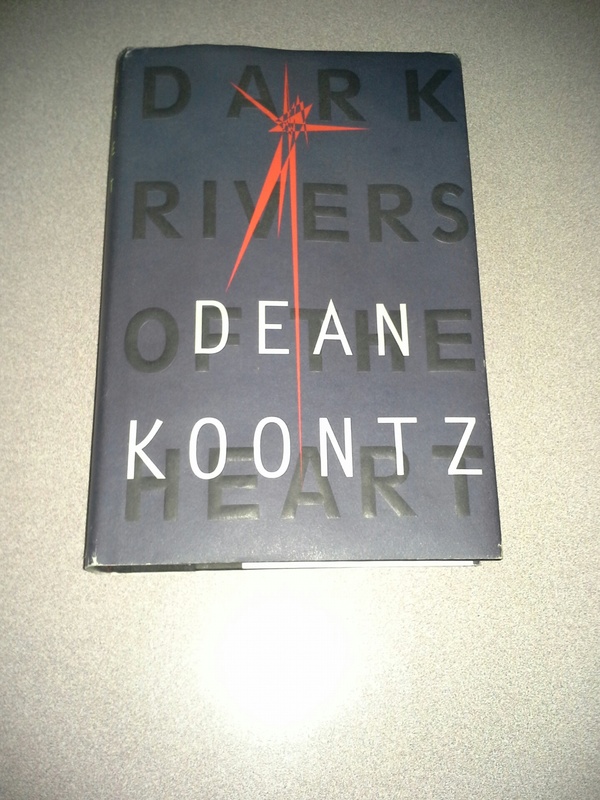 I just finished another Dean Koontz book, “Dark Rivers of the Heart,” (1994, Alfred A. Knopf, Inc.) True, not one of his newest (or, to be honest, one of his best), but with the amount of books Koontz has written sometimes you need to go back to his earlier works just because. In this case, his theme deals with what’s happening with this country’s government and how, as it gets bigger, its ethics and morals shrink. Still relevant today, no? Of course, being Koontz, it’s also about the nature of evil. Sorry, no supernatural elements in this book, but he makes up for that by including not one but two serial killers. Combine that with political intrigue, an urgent search, a desperate flight from the authorities and a terrifying encounter with this nation’s property seizure laws and you’ve got vintage Koontz. Stop me if you’ve heard this one, but a man walks into a bar and meets a cocktail waitress. Spencer and Valerie (not their real names) strike up a conversation, get along and he goes back in the next night to see her again. But she never shows up for her shift. Now he KNOWS this isn’t because of him, so he goes to her place to make sure she’s alright. Bad move. Someone else is looking for her as well, someone named Roy. Roy is a chief operative of a rogue government agency that pretty much does whatever it wants to whoever it wants. Like this waitress and this guy. Well, Roy and his boys blow the living you-know-what out of her place with the guy barely escaping with his life. And the chase is on! And being Koontz, there’s plenty going on here. But the main thing in this book is the examination of different kinds of evil: ideological, institutional and stand alone evil. Let’s start with Roy, the government operative we met above. He’s the first of the serial killers we meet. You see, Roy is a believer in Utopia and the perfectibility of the human race – by a select group of superior humans. He being one of them, of course. Those who can’t fit in to the perfect world need to be compassionately dealt with. With carefully placed bullets. Heck, sometimes people just having a bad day need compassion too. Or those with disabilities. The need is never-ending and Roy is a very compassionate person. And since there is no god but the State, he can make up the rules as he goes. Not as dramatically horrifying as Roy, but more overwhelmingly oppressive, is the institutional evil of a too-powerful State. You see, Roy isn’t ALWAYS compassionate. Sometimes he’s a bit thin-skinned and gets pissy. Then, instead of showing compassion, he just makes life miserable for his target. Like the unfortunate LAPD captain, Harris Descoteaux. He made the mistake of saying that, “No one’s more dangerous than a man who’s convinced of his own moral superiority,” to Roy. Who, naturally, is convinced of his own moral superiority. Roy considers killing him, but then decides that “Greater punishments than death were within his power to bestow.” Like introducing Harris to our country’s asset-forfeiture laws. Current as of 1994, the laws and government powers Koontz illustrates are scary beyond belief. To think that our own country has this ability and actually uses it against its citizens is chilling. Finally, we meet the second serial killer, Steven. Steven is the real deal, a serial killer refined and distilled to its essence. He tortures his victims horrendously before inflicting a slow death and then using their bodies for his “artwork.” He has contempt for Roy and mocks him mercilessly: ” . . . you should hear Roy rant on about compassion, about the poor quality of life that so many people live and shouldn’t have to, about reducing population by ninety percent to save the environment. He loves everybody. He understands their suffering. He weeps for them. And when he has a chance, he’ll blow them to kingdom come to make society a little nicer.” So what is Roy doing wrong? Why doesn’t Steven give him the approval and validation he craves? Simple: “Roy doesn’t understand that these things have to be done for fun. Only for fun. Otherwise, it’s insane, it really is, to do it for some noble purpose. . . . He’s the least prejudiced, most egalitarian, foaming-at-the-mouth lunatic who ever lived.” Like I said, stand alone evil. Pure, dark nihilism. And, of course, Steven is right. All Roy’s wonderful “motives” are personal rationalizations. I won’t give away how all these strains of evil play out in this novel. There are plenty of twists and turns to enjoy, and Koontz’ characters are marvelous as usual. But spend some time meditating on the nature of evil as Koontz lays it out here, and you will realize that there are things afoot in our world and our country that we had better pay attention to.